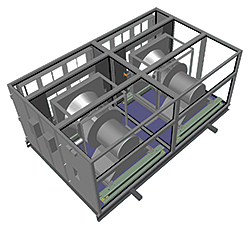 Vision indoor air handlers are in side-by-side arrangement with options for energy recovery wheel and dual belt-drive plenum fans. Side-by-side configuration is up to 70 inches shorter than vertical arrangements, according to the company. Plenum drives option can offer up to 100 percent redundancy. Designed for new building construction with small or restricted access areas.